Well as it turns out, the three best box toppers of all time, in my opinion of course, all made their debut in 2003. 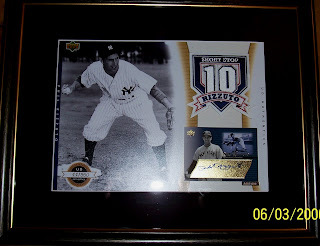 The following framed piece is from Upper Deck Authentics. I remember the card set itself being a total dud but this framed piece is awesome. Measuring approximately 17x20 and depicting legendary, Yankee's Shortstop, Phil Rizzuto. This piece presents beautifully and combines a black and white 8x10, manufactured commerative patch and UD Authentics on-card autograph, all housed in a glass fram and numbered to 350. Good luck finding any of these on the secondary market, as once again player collectors snathced up their favorites in a hurry. Unopened boxes are rarely found and when they do expect to pay anywhere between $200 and $250.